The researchers, led by electrical engineer Stephen Chou, were able to increase the efficiency of the solar cells 175 percent by using a nanostructured "sandwich" of metal and plastic that collects and traps light. Chou said the technology also should increase the efficiency of conventional inorganic solar collectors, such as standard silicon solar panels, although he cautioned that his team has not yet completed research with inorganic devices. 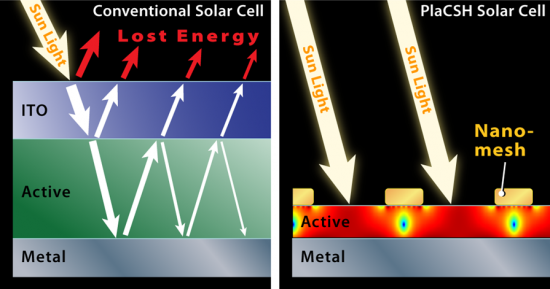 Chou, the Joseph C. Elgin Professor of Engineering, said the research team used nanotechnology to overcome two primary challenges that cause solar cells to lose energy: light reflecting from the cell, and the inability to fully capture light that enters the cell. With their new metallic sandwich, the researchers were able to address both problems. The sandwich — called a subwavelength plasmonic cavity — has an extraordinary ability to dampen reflection and trap light. The new technique allowed Chou's team to create a solar cell that only reflects about 4 percent of light and absorbs as much as 96 percent. It demonstrates 52 percent higher efficiency in converting light to electrical energy than a conventional solar cell. Chou said the system is ready for commercial use although, as with any new product, there will be a transition period in moving from the lab to mass production. The physics behind the innovation is formidably complex. But the device structure, in concept, is fairly simple. The top layer, known as the window layer, of the new solar cell uses an incredibly fine metal mesh: the metal is 30 nanometers thick, and each hole is 175 nanometers in diameter and 25 nanometers apart. (A nanometer is a billionth of a meter and about one hundred-thousandth the width of human hair). This mesh replaces the conventional window layer typically made of a material called indium-tin-oxide (ITO). The mesh window layer is placed very close to the bottom layer of the sandwich, the same metal film used in conventional solar cells. In between the two metal sheets is a thin strip of semiconducting material used in solar panels. It can be any type — silicon, plastic or gallium arsenide — although Chou's team used an 85-nanometer-thick plastic. The solar cell's features — the spacing of the mesh, the thickness of the sandwich, the diameter of the holes — are all smaller than the wavelength of the light being collected. This is critical because light behaves in very unusual ways in subwavelength structures. Chou's team discovered that using these subwavelength structures allowed them to create a trap in which light enters, with almost no reflection, and does not leave. "It is like a black hole for light," Chou said. "It traps it." The team calls the system a "plasmonic cavity with subwavelength hole array" or PlaCSH. Photos of the surface of the PlaCSH solar cells demonstrate this light-absorbing effect: under sunlight, a standard solar power cell looks tinted in color due to light reflecting from its surface, but the PlaCSH looks deep black because of the extremely low light reflection. The researchers expected an increase in efficiency from the technique, "but clearly the increase we found was beyond our expectations," Chou said. Chou and electrical engineering graduate student Wei Ding reported their findings in the journal Optics Express, published online Nov. 2, 2012. Their work was supported in part by the Defense Advanced Research Projects Agency, the Office of Naval Research and the National Science Foundation. The researchers said the PlaCSH solar cells can be manufactured cost-effectively in wallpaper-size sheets. Chou's lab used "nanoimprint," a low-cost nanofabrication technique Chou invented 16 years ago, which embosses nanostructures over a large area, like printing a newspaper. Besides the innovative design, the work involved optimizing the system. Getting the structure exactly right "is critical to achieving high efficiency," Ding said. Chou said that the development could have a number of applications depending on the type of solar collector. In this series of experiments, Chou and Ding worked with solar cells made from plastic, called organic solar cells. Plastic is cheap and malleable and the technology has great promise, but it has been limited in commercial use because of organic solar cells' low efficiency. In addition to a direct boost to the cells' efficiency, the new nanostructured metal film also replaces the current ITO electrode that is the most expensive part of most current organic solar cells. "PlaCSH also is extremely bendable," Chou said. "The mechanical property of ITO is like glass; it is very brittle." The nanostructured metal film is also promising for silicon solar panels that now dominate the market. Because the PlaCSH sandwich captures light independent of what electricity-generating material is used as the middle layer, it should boost efficiency of silicon panels as well. It also can reduce the thickness of the silicon used in traditional silicon solar panels by a thousand-fold, which could substantially decrease manufacturing costs and allow the panels to become more flexible. Chou said the team plans further experiments and expects to increase the efficiency of the PlaCSH system as they refine the technology.